Like many of Colorado's winemakers, Steve Flynn started as an amateur home winemaker. 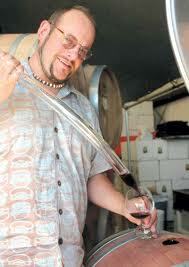 In 2009, Steve decided to start Vino Salida in Salida, CO. One of the unique characteristics is the winery's location. Most of the state's wineries are located in the Grand Valley AVA, the West Elks AVA or along the Front Range between Fort Collins and Colorado Springs. Salida is a old mountain railroad town and at almost 6,000 residents is Chaffee County's most populous city. Even at such a small size, Salida was already home to another winery, Mountain Spirit Winery. It is not the center of the wine industry or a large metropolis bustling with consumers eager to drink wine, but Steve has decided to make Salida home for his young winery. I started making wine as a sophomore at Tupper Lake High School in 1985. My biology teacher was very inspiring, and, upon learning that I could create my own alcohol in my home kitchen, I embarked on orange juice wine and concord grape juice wine. If I weren’t in the wine business I would be in the restaurant business. Sleep, eat, drink, clean house & laundry, play with the cat, and enjoy my fiancée Judy’s company. Barolo, Italy. I would like to study the white wines of the Barolo region, and the red grapes Dolcetto, Barbera and Nebbiolo. I find it fascinating that these grapes are used to create new wines, everyday table wines, and special “Sunday dinner” wines. Also, the pairing of these regional wines with local food would be a major reason to live there. Great question...A blend of Gregorian chant, Jimmy McGriff, and Hank Williams III. The uniqueness of being able to grow world-class grapes in our state and the friendly folks that grow them. CWP: Wheredo you see the Colorado wine industry in 10 years? In 10 years, our wineries will be more integrated into our local communities as a source of local wine, unique places to hold events and hubs of local foodie culture. What was the last bottle of Colorado wine that made you feel that Colorado winemaker’s are on the right track?